Supervisor of Elin Thorsén’s Ph.D. thesis (2016‒), University of Gothenburg, Sweden. Co-supervisor of Anna Tessmann’s thesis On the Good Faith: A Fourfold Discursive Construction of Zoroastrianism in Contemporary Russia. Public defence May 16, 2012. May 17, 2017, “To Study Religion in India” at the Department of Linguistics and Philology, University of Uppsala, Sweden. Fall semester 2013, “Introduction to Hinduism” within the STINT program Excellence in Teaching at Haverford College, USA. September 21, 2012, “The Academic Study of Religion in Sweden” Department of Sociology, Pondicherry University, Puducherry, India. April 10, 2012, “Deep Realism” Banaras Hindu University, Department of Philosophy and Religion, Banaras Hindu University, Varanasi, India. October 19, 2011, “The Catholic Church in Sweden. Opportunities and Challenges in the 21st Century” Seminary of the Immaculate Conception, New York, USA. October 17, 2011, , “Religious Studies and the Mission of Catholic Liberal Arts Education” Our Lady Seat of Wisdom Academy, Ontario, Canada. 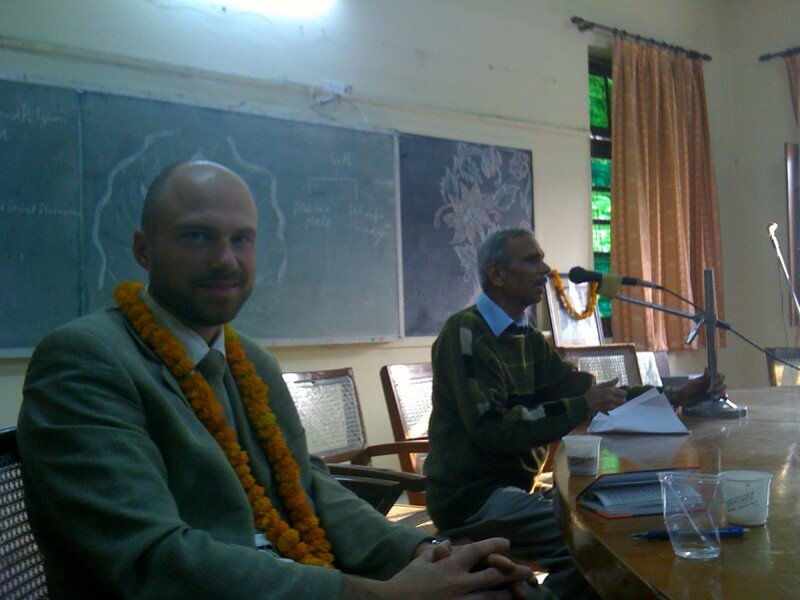 March–April 2011, “Religion and the Secular State” (6 lectures during three weeks), Department of Philosophy and Religion, Banaras Hindu University, Varanasi, India. October 2010, (Two weekends of lectures) “Contemporary Theories of Religion” Center for Interdisciplinary Postgraduate Studies (CIPS) Master of Arts Degree in Religious Studies at the University of Sarajevo, Bosnia. November 2008, (One weekend) “Contemporary Theories of Religion” (Rational Choice Theory and cognitive studies of religion), at CIPS, Sarajevo, Bosnia. November 2007, (One weekend) “Religions of the World” (Hinduism, Buddhism, Jainism, Confucianism, Daoism and Shinto) at CIPS, Sarajevo, Bosnia. November 14, 2017, “Yoga and Catholic Novels: How to make Sense of Religion in the Modern World.” Collegium Institute, Philadelphia, USA. November 9, 2017, “On Spiritual Warfare: Michael O’Brien and the Struggle for the: Soul of Western Civilization.” Our Lady Seat of Wisdom College, Barry’s Bay, Canada. January 14, 2017, “The Post-Christian Sweden in Numbers” Signum editorial board meeting, Uppsala, Sweden. October 2016, “A Most Secular Nation” at Tradfest, Zagreb, Croatia. March 1, 2014, “Mystical experiences in the novels of Michael O’Brien” at the Centre for the Study of Indian Languages and Society, Varanasi, India. December 10, 2013, The Collegium Institute and the Circle of St. Bede “From Theology to Religious Studies? Catholic approaches to studying non-Christian traditions” at Penn Newman Center, Philadelphia, PA, USA. October 25, 2013, The Neumann Forum’s monthly breakfast discussion “Religious Studies and Catholic Liberal Arts Education” at Villanova Law School, PA, USA. November 21, 2012, “Den Rituella människan” [The Ritual Person], Guldheden, Göteborg, Sweden. May 19, 2006, “The Da Vinci Code: Fact or Fiction?” Scandic Bergen City, Bergen, Norway. May 22, 2006, “The Catholic Church and the Da Vinci Code” Familie & Medier, Salem, Bergen, Norway. March 2005, “The Phenomenon of the Da Vinci Code” Lecture at the students union, University of Bergen, and at Catholic Forum (Bergen) September 2005, Norway. April 2005, “The Catholic Church at a crossroad: the papal election 2005.” Lecture at the students union, University of Bergen, Norway. April 2005, ”The Pope a politician?” Lecture arranged by the students at the institute for comparative politics at the University of Bergen, Norway. October 2005, “Religion and Religious studies in Norway 2005.” Lecture as part of the program “Humanistic studies in the nation” at the Faculty of Arts (The University of Bergen) in order to celebrate the 100 year jubilee of the Norwegian nation, Norway. February 2004, ”To define the notion of religion.” Lecture at the University of Bergen, Norway. 1998, “Reincarnation of what?” Lecture at the University of Gothenburg, Sweden.